My mother is a mystery to most people, partly because she speaks minimal English, but I know exactly who she is. She is an amalgam of beauty, strength and sweetness. She keeps the cleanest house I’ve ever seen, calls me relentlessly, and prepares the most exquisite meals. Oh, how I love her cooking! From K to 8, she packed me a gourmet lunch, which often consisted of rice, beans, steak, and soup. The other kids at the lunch table would stare with intense jealousy as I dug in. Their banal peanut butter and jelly sandwiches couldn’t compare, and we all knew it! Like any world-renowned chef, the secret to her amazing cooking is pure love and devotion. She is a proud, hardworking Latin@, and she has raised me to be an equally proud, hardworking Latin@. This picture was taken the first time she came to visit my new home, California. For most Americans a trip to another part of the country is standard fare. But for much of my life, my mother’s immigration status restricted our ability to travel and so there were no family vacations for us. There is honestly no better feeling than treating your worn out mother to a trip of a lifetime. When I picked her up at the San Francisco in my new car, the light in her eyes shown brightly. 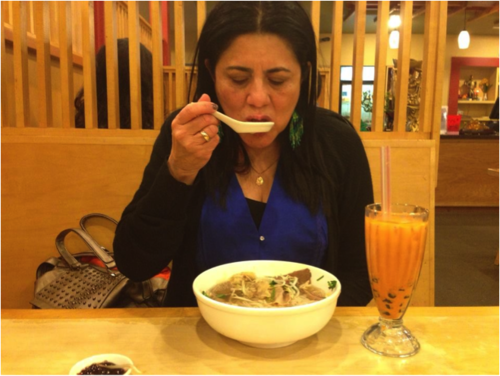 My mother beamed as she sat down for her first bowl of pho, a Bay Area tradition. I beamed as I took this picture. Food continues to be the medium through which my mother and I express our love. She gave me the most when we had the least, and now, it is my turn. Who would have thought this Colombian mother and her American daughter would one day be enjoying a Vietnamese delicacy in California? This is my mother, and I am proud of her. Elizabeth is a new Californian by way of New York City.